Capitalism is in crisis and for thirty years they have tried to make us pay for it. First they destroyed our wages with inflation, then they destroyed our jobs through restructuring and then they increased our exploitation in the drive for productivity. And still this is not enough: Now they want to deny us a right to even a minimum standard of living in retirement. This is not, of course how our capitalists present the crisis. Really, they say, the system is a victim of its own success. The standard of living is so good that we are now all living too long and so the “generous” pension schemes of the past can no longer be supported as too few current workers will have to support too many living on pensions. They also state that the retirement age is falling in real terms because people are taking “generous pensions” early. All these are lies on several counts. Let’s take the question of real retirement ages. Its true they have been falling as many older workers have been driven from work (as being too expensive). However this only brings real retirement in Britain into line with something like that of the rest of the EU, as the table from the Financial Times below shows. The same table also shows that even this has halted and retirement ages are being pushed back up as more workers have lost their pensions through various capitalist frauds and now have to work longer (see below). If we then take the demographic argument, it is true that the number of pensioners will rise by about 50% from around 11 million to 17 million by 2050. However pensioners are not the only non-working group in society and as the number of pensioners rise so the number (for example) in school-age children will decline. Even according to the state’s own projections nothing will change between now and 2050 in that about 28 million employed workers will support about 32 million “others”. It is also true that at current levels, if no change is made to the state pension scheme then spending on pensions (again according to official projections) will rise from about 6.2% to 7.5% of GDP (1). As the European average is already at 11% this hardly represents a crisis. So why have the bosses been moaning about the cost of pensions. Why have many workers lost their pensions rights and why has the government set up a Pensions Commission under former CBI boss Adair (now Lord) Turner? In Britain the theft of private pensions by companies has been going on for years, not just through well-publicised scandals like that of Maxwell and Daily Mirror workers, but through the systematic plundering of pension funds to cover the fall in profits faced by industries as a result of the deepening of the capitalist crisis. Throughout the 1990s many companies stopped making contributions to occupational schemes and so saved themselves an estimated £18 billions. Naturally enough they didn’t tell staff they had taken a so-called “pensions holiday” believing a strong stock market would cover their theft. Workers continued to make their payments into the fund, discovering the fraud when the companies ditched their final salary schemes after the collapse of the stock market. Companies such as Unilever went further and transferred the pension fund (to the company balance sheet) and took it as profit. Since 1992 Unilever has taken £1,2 billions from the pension fund and handed two-thirds of it to shareholders as dividends. Until recently, scandals such as these were blamed on greedy companies or the fall in the stock market. All this is perfectly legal since it is often the directors of the company who are the trustees of the pension scheme who are only bound by the rules of the scheme and not by any legal restrictions. As we demonstrated a couple of years ago (in Revolutionary Perspectives 29) it is not unknown for these trustees to give themselves a rich payout and then close the scheme, putting their employees remaining money in a new, and less remunerative, scheme. With company pension schemes in such a mess why should the Turner Plan (which ostensibly focuses on the state retirement scheme) be a useful diversion for our private bosses? In the first place it repeats the lie that the pensions crisis is a demographic one. It ignores the corruption, the mis-selling scandals, the outright robbery, the mismanagement of funds when the stock market was booming. These are all the consequences of the profits crisis of capitalism which you would not expect a former director of the CBI to highlight. In the second place it offers to create a state system which is slightly more generous and which bosses can then opt into. It would allow many of them to wind down or abandon their own schemes and thus pay less to maintain a pension fund (and yet still say they were meeting their obligations). This is why some bosses organisations like the European Engineering Federation have welcomed it. Others, like Sir Digby Jones of the CBI, have called the Plan “the most serious proposals for pension reform yet” but at the same time have criticised it as a “tax on jobs”. Apart from being untrue (as we showed above Britain would still have a contribution rate at just over half the European average and labour costs would only rise by 0.6%) this criticism is useful since if the CBI opposes it many workers might think it acceptable. The Turner Plan is indeed a model of ruling class cleverness (he is not a Lord of the Realm for nothing). The retirement age is set to rise to 69 by 2050 but not for while. No change is envisaged before 2030 (when it would begin to rise by a year every five years). This means that nobody 50 or over will be affected, those over 40 would have one year added to retiring age whilst those who will be worst hit have not even entered the labour force yet. The calculation is that this will weaken opposition. Employers and their Conservative Party supporters however, have also used the pensions debate to question the deal between the Government and public sector workers unions which would allow state workers to retire at 60. They argue that it is unfair for people like classroom assistants to retire at 60 whilst industrial workers would retire at 69. It is unfair but the answer is not for everyone to work longer but for everyone to have the right to retire at 60. The only reason capitalism cannot grant this is because it would undermine their whole plan which is to make us pay more, work longer and die quicker so that pension payments are cut. The real crisis is the poverty of so many pensioners today. According to the National Pensions Convention there are 4 million pensioners living below the poverty line (the Government admits to 2 millions). They are concealing the fact that there are 2 million more pensioners in poverty than the statistics show. The reason they are so poor is made clear below by the graph from the Daily Mirror. When the current pensions scheme was introduced as part of the Beveridge reforms (4) under the 1945-51 Labour Government they were intended to be only a guarantee of basic “subsistence”. 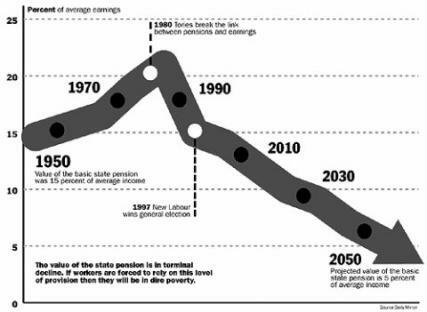 However, as the accumulation cycle of capitalism was in an upturn during the 1950s, and 1960s, pensions were increased. By the early 1970s they were over 20% of average earnings. However this was also when the crisis hit and the first response of the state was to print more money to solve the crisis. This only created inflation. As workers then fought and won higher wages, pensions also went up until the Thatcher victory in 1980. As one of the first cost-cutting measures of the new regime the link between earnings and pensions was broken. The real value of pensions has been falling ever since, and both Tory and Labour Governments have made further cuts in pension provision for ordinary workers. The real value is back where it was in 1950 at 16% of average earnings. A second pension system set up under Labour in the 1970s called SERPS was gradually cut and Norman Fowler then allowed people to opt out so that they could buy personal pensions from the insurance industry. This has led those on low incomes to be robbed blind and to several financial scandals as these insurance firms mis-sold pensions by promising returns which were either totally unrealistic or not even worth the amount that was paid in. (5) In fact, as we wrote in RP35, all ideas by both Labour and Tories for anything other than the declining state pension have been about helping the rich. Half of the current state spending on pensions is on tax relief for private pensions for the wealthier segments of society. If we add that women will have to have their retirement age raised by 2008 (EU directive) and that the current Government wants to exclude overtime payments and weekend pay from pension contribution calculations then we can see that the situation can only get worse even if the Turner Plan is adopted. So far the only response of the Government is to say that they are worried about the costs which can mean only that they think Turner is too generous. Brown introduced Pension Credit in 2003. This is a complicated means tested benefit which not all the officers of the Department of Works and Pensions understand. About 2 million pensioners who are entitled to it don’t get it mainly because they have to apply for it and cannot understand it or don’t know how to. For Brown it is cost-effective (it obviously saves lots of money if people don’t apply for it) and thus he is suspicious that the Turner plan will cost too much if it guarantees at least part of a pension for all. A civilised society is one which looks after all its citizens, particularly those who are most vulnerable. But as Marx revealed a century and half ago capitalism doesn’t deal in sentimental abstractions like “care” and “community”. Only the cash nexus rules in capitalist relations. Indeed some may even be asking why capitalism conceded pensions to us in the first place. Well, it wasn’t due to a coup by Help the Aged. It was much more to do with the needs of imperialist war and the exigencies of the class struggle. 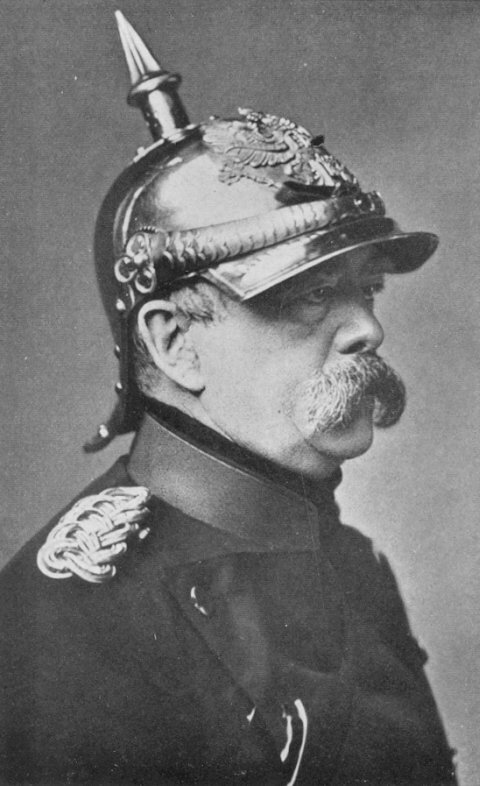 That the state should concern itself with those of its citizens who need help to a greater degree than hitherto ... is a conservative policy which has as its goal to encourage the view among the unpropertied classes ... that the state is not only a necessary institution but also a beneficent one. He stated that he did not care if his opponents called it “socialism” but that its aim was to “deal with social democratic excess”. By cowardly giving way in their everyday conflict with capital ... certainly disqualify itself from initiating any larger movement. The fight to defend pensions is no different from the fight to defend any other aspect of our daily lives. The only reason pensions are under attack now is because the capitalists have succeeded in the last twenty years in making us pay for the crisis in lost jobs and wage cuts. With cuts in the social wage coming via the dismantling of free health care and the social security system, pensions are the last area to be attacked. However Marx also warned that if we simply fight to defend ourselves from the attacks of capitalism, and exaggerate the permanence of each victory, we would in the long run always lose, since we would only be fighting the symptom of the disease and not the cause, which is the system of exploitation itself. In the last couple of years workers in many of the main capitalist countries have shown us how to fight. In 1995 in France the so-called Juppe Plan aimed to make massive cuts in the social state but this led to a huge wave of strikes and Juppe went. Instead the French state bided its time and in 2003 decided to make its attack section by section and is achieving greater success. The clear majority of the conclusions are progressive and meet the tests we set in advance. But then his pension scheme is safe! This union feebleness was also visible at Scottish Power. At the start of this year Scottish Power said existing workers had to contribute 2% more of their pay to the pensions scheme and new workers would have to retire at 65 not 63 as at present. This would have been a robbery of another £150 millions from the workforce. Amicus leaders accepted the framework of these demands and just thought that the only thing that could be achieved was some discussion over details. Ordinary workers however were angry and put pressure on their shop stewards to demand a strike ballot. This idea was also taken up by other Scottish Power workers in unions like Prospect and Unison. Given even this threat of united action Scottish Power backed down and came up with new proposals which mean that those on the current scheme retain their rights. New workers will have to join a money purchase scheme but after 10 years they can move to the final salary scheme. The message is clear. The bosses hope to divide us section by section, age group by age group, employment status by employment status and union by union (and the unions will assist them in this). Only the most widespread unity and solidarity can fight back. At the moment public sector workers all face new attacks but they are all timed differently. Local government workers in England and Wales have since last year faced an abandonment of the “the rule of 85” (your age plus your years worked add up to 85) which means they cannot claim a full pension until 65 and they will lose 30% of the former pension if they retire at 60 (see article on trades unions in this issue). The same threat hangs over Scottish local government workers this year. Civil servants face the same rise in retirement age but not until 2013 (so over 52s won’t be affected). The same thing is planned for teachers and lecturers. Lower paid workers doing manual jobs for local authorities face an increase in contributions of 6-7% and they will find that overtime will be excluded from any calculations. Fighting singly these groups are unlikely to win but fighting together then they have a greater chance of success. However even here the public sector workers need to demonstrate to all workers that they are heading the fight for pensions in both private and public sector. At the end of the day we should also ask ourselves what kind of society is this miracle called capitalism. Millions in the south of the planet will die of malnutrition and war as a direct consequence of the system’s greed and now it cannot even guarantee a decent retirement for those who given their labour all their lives. The fight for pensions should also raise the spectre of a fight for a better society where work is not an alienating form of exploitation but a positive contribution by each member of society to the collective community. The principle “From each according to ability, to each according to need” is the basis of a sane society. This capitalism certainly isn’t. Its time we pensioned it off. 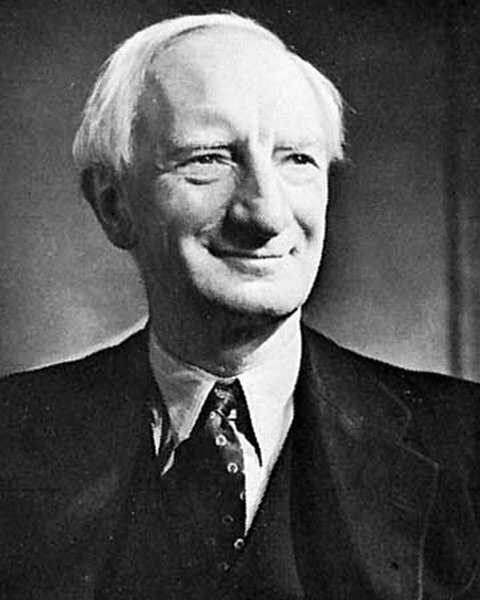 (4) The Beveridge Report was finished in 1942 calling for a universal but very basic pension provision which was to be paid for by national insurance contributions. (5) It is the insurance business that is screaming loudest against Turner since he aims to cut them out from the new scheme on the grounds of their past history for robbing their clients. After first denouncing the Report they are now arguing that they can do the job just as cheaply as the state scheme! (7) The roots of the identification of statism with socialism in German Social Democracy will be examined in our next issue.